Dreamliner set to fly in a week as Boeing fixes battery – Reuters » OPShots.net - Cyberhub to Cleveland Aviation and the World! Boeing began installing reinforced lithium-ion battery systems on five 787 jets in Japan on Monday, starting a process that should make the first commercial Dreamliners ready to fly again in about a week.Boeing’s Dreamliners have been grounded since regulators ordered all 50 planes out of the skies in mid-January after batteries on two of them overheated. U.S. regulators approved a new battery design on Friday, clearing the way for installation.The grounding has cost Boeing an estimated $600 million, halted deliveries and forced some airlines to lease alternative aircraft. Several airlines have said they will seek compensation from Boeing, potentially adding to the plane maker’s losses. Investors expect to learn more about the costs when Boeing reports second-quarter earnings on Wednesday. 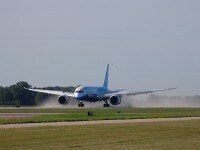 via Dreamliner set to fly in a week as Boeing fixes battery – Yahoo! Finance.